Scotland ended their European Championship campaign with a third defeat out of three as France ran in seven first-half tries. Olivier Arnaud, Kevin Larroyer, Morgan Escare, Stanislas Robin and Ugo Perez added to Tony Gigot's brace as France stormed ahead. David Scott and Liam Hood scored second-half consolations for the Scots. Wales won the tournament after beating Ireland 30-4 in Bray, the Welsh maintaining their 100% record. Dale Ferguson captained Scotland in Avignon , with regular skipper Danny Brough ruled out with a damaged hand. Ferguson, who made his international debut in 2010, was the most experienced member of the squad and led a group with an average age of just 22. Finlay Hutchison, Gavin Grant and Sam Brooks debuted for Steve McCormack's side. 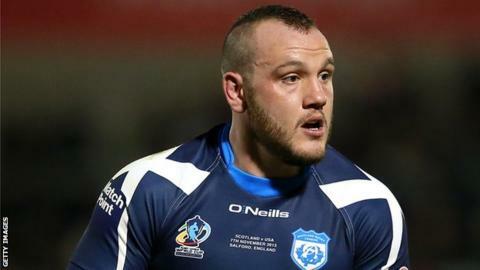 Scotland squad: Danny Addy (Bradford Bulls), Sam Brookes (Whitehaven), Harvey Burnett (unattached), Lewis Clarke (Edinburgh Eagles), Sonny Esslemont (Hull KR), Dale Ferguson (Bradford Bulls), Gavin Grant (Coventry Bears), Richard Harris (Warrington Wolves), Liam Hood (Salford Red Devils), Finlay Hutchison (Edinburgh Eagles), Ben Kavanagh (Widnes Vikings), Corbyn Kilday (Central Queensland Capras), Joe McClean (Gloucs All Golds), Scott Plumridge (Edinburgh Eagles), David Scott (Doncaster), Oscar Thomas (London Broncos), Shane Toal (Barrow), Alex Walker (London Broncos).